QQ Instant Messaging is the most popular IM software in China with more than 45 million concurrent users. Most of the users are mainly Chinese as the IM software is all in Chinese. This had made it almost impossible for foreigners until now. 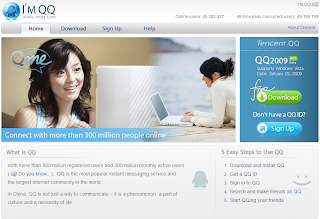 Tencent had recently just launched an English version website ImQQ.com which will allow any english speaking user to download an English version of QQ and registed a QQ id. Go check it out. yes i also want a qq messenger for mobile in English ! !! DOnt think QQ English on android is available but you may want to try using a product developed by the same company called wechat. With wechat, you can also connect to QQ.